1 – Why Merge The Gospels? 2 – Have The Gospels Been Merged Before? 3 – Why Include The Gospel of John? FIVE COLUMN: The Synoptic Gospel is the name of an advanced word-for-word four Gospel harmony, that aligns the complete texts of the Four Gospels of the New Testament in four columns side by side, next to a Fifth Column which contains a precise, unified merger of all of their words. 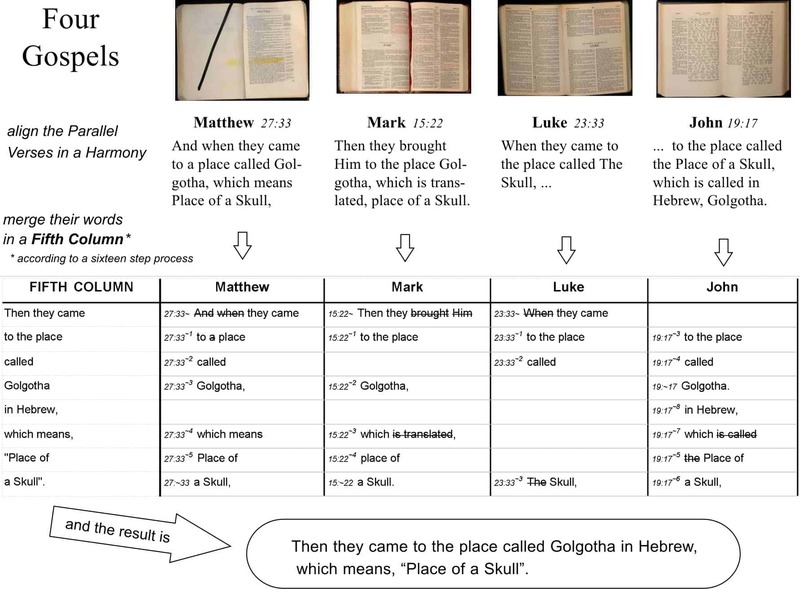 Where two or more of the four Gospels are telling the same saying of Jesus Christ, or are describing the same events, these parallel passages and synoptic verses were split into individual words using a precise system of notation, so that they could be accurately compiled on a true word-for-word basis. The textural merging process that produces the words of the fifth column is a Sixteen Step Merging Process. The fifth column harmonized text eliminates all of the overlap and duplication, while retaining every detail from each of the Four Gospel accounts. The Text of the fifth column of the FIVE COLUMN database is reprinted as, The Synoptic Gospel: The Story of The Life of Jesus. A red-letter edition of the same text is available as, The Red Letter Gospel: All The Words of Jesus Christ in Red. 2. The words of the Gospel columns are aligned for equivalency of meaning. 3. By copying only one occurrence of each parallel word into the Fifth Column, the duplication is removed. 4. And the harmonized result is... a single, complete account of what happened. The fifth column of the FIVE COLUMN database is reprinted as The Synoptic Gospel: The Story of The Life of Jesus. 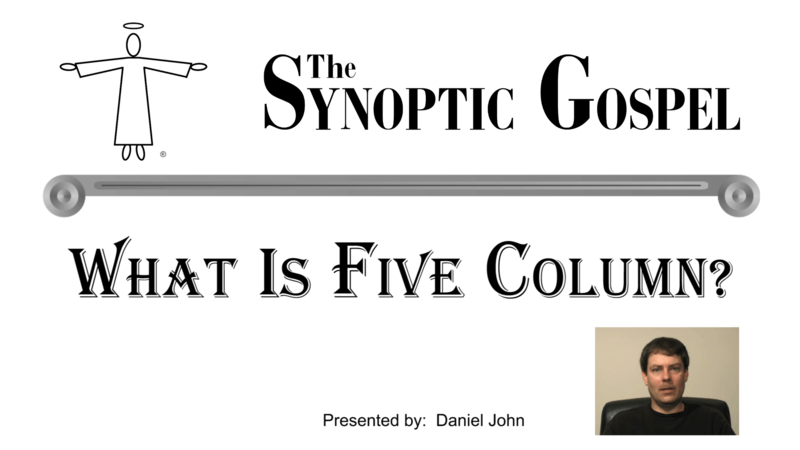 FIVE COLUMN: The Synoptic Gospel uses the NASB (New American Standard Bible) version of the Four Gospels. Click here to see Testimonials about this amazing work! © Copyright 2009 - 2019 by Smart Publishing Ltd..